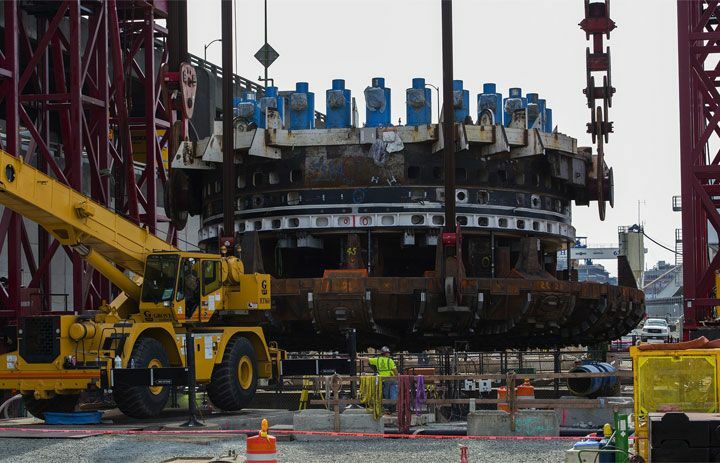 Bertha’s repaired cutter drive is being reunited with the buried machine in a 4-million-pound operation. Tunnel-boring machine Bertha’s bulked-up front end is approaching the bottom of a 120-foot deep repair-access pit Tuesday morning, raising contractors’ hopes they can dig again by November. The round cutterhead and its drive parts hung overnight from a big red lift tower, some six feet below the lip of the vault, after a successful move on Monday. As of 8 a.m., crews with Dutch lifting company Mammoet had lowered the 4 million pound load to within 20 to 30 feet of the vault floor, said Laura Newborn, spokeswoman for the Washington State Department of Transportation. Any time now, Bertha’s face will land on a wooden skid, at a 2-degree tilt. The date Bertha overheated and stalled. 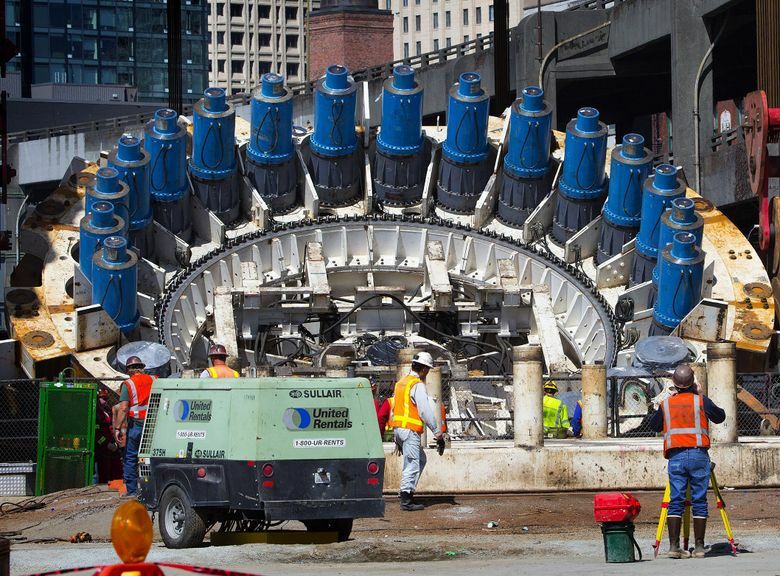 The target date it’s hoped Bertha can resume tunneling. 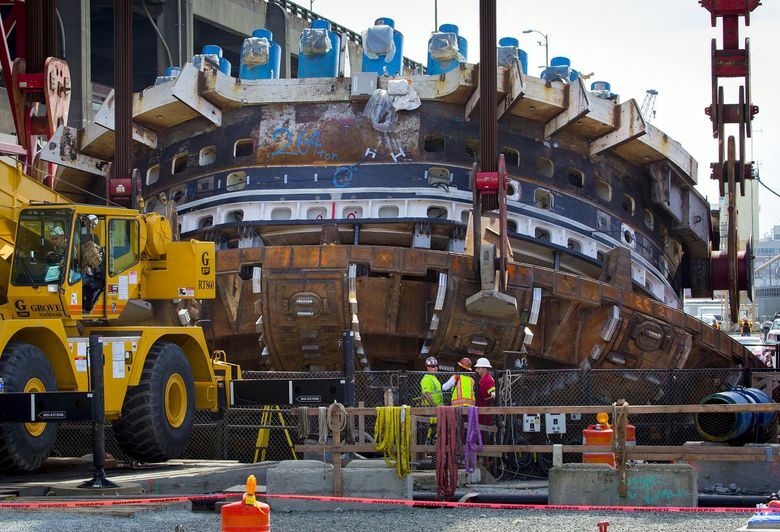 Crews need two days to gingerly maneuver the disc-shaped assembly up and down, back and forth, until it can be reunited with Bertha’s buried main section, the length of a football field. Repairs have been under way since March, when the front end was brought to the surface, using a giant red tower near Pioneer Square. Hundreds of teeth have been added to the cutting face, to better scour dirt. During a stall Dec. 6, 2013, the ground “pancaked” and the face spun without gripping soil. New inner and outer seals were installed, with stiffer rubber components designed to block grit from circulating. During the breakdown, grit invaded the bearing, while metal fragments dropped and chipped gear teeth. Longer steel arms and fins were added up front, to stir muck before it enters the conveyors. About 86 tons of reinforcing plates have been added to stiffen the machine. Arguably, the rescue lift and descent have been the only trouble-free phases for Seattle’s celebrity tunneling machine, which began its odyssey two years ago from Sodo toward South Lake Union. People stopped Monday to watch from a pedestrian route south of the pit. If digging resumes by the Nov. 23 target, STP anticipates the four-lane, tolled tunnel would open in March 2018. As of June, the state has paid $1.04 billion toward STP’s $1.35 billion contract, says a summary released to The Seattle Times. Hitachi-Zosen, which built Bertha, is now shouldering this year’s expenses for parts and repairs, likely tens of millions of dollars. An expert panel estimated potential overruns at just over $300 million, mainly for delays, though WSDOT says it holds about $140 million in contingency money, and that it’s contesting nearly all the contractors’ claims for extra money.